Create a greater involvement and interest for savings and to active both new and existing customers to take hold of their savings. What would you do if you had all the money to do exactly what you want? To engage customers to get started with their savings, we created the thesis that everyone should have "ah-now-it's-time-to-skip-this" money at their savings account. At the campaign site one could express their own "dream of freedom" (i.e. create their own version of the ads/banners in the campaign) and match it with an image and a font of their choice. The contributions were collected in a gallery which made it possible for visitors to browse and be inspired by all freedom dreams. Everyone who created their own dream of freedom also took part in a competition for a savings capital of 25,000 SEK. 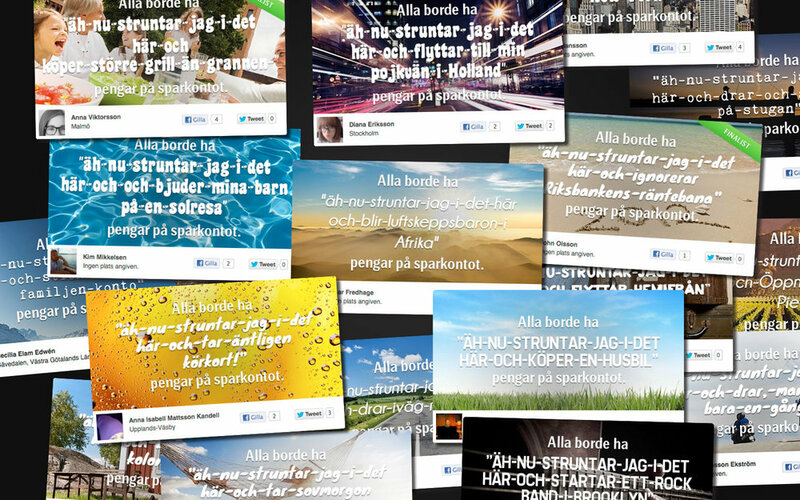 In addition to prize money, the winner got to see their work published as a banner on Aftonbladet.se, one of Sweden’s largest websites. When one created an entry it was published at the campaign site and at the participant's Facebook wall. Thousands of contributions was created and spread the idea of having a freedom account. Many proceeded to create contributions even after the campaign period. 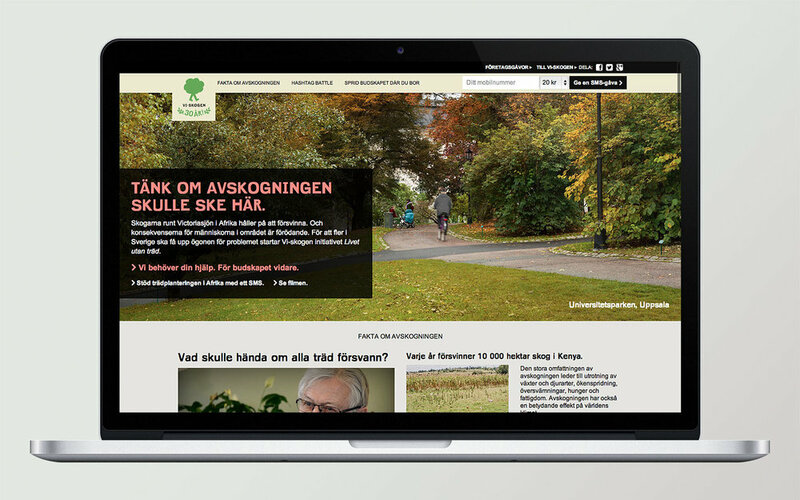 Raise awareness of the deforestation in eastern Africa and to get more people to know about the relatively unknown Swedish development cooperation organization Vi-skogen, who reaches over one million people through tree planting, training and advice. How would our city parks look like, without a single tree? Using advanced photo techniques we created realistic photos and animations of how some of Sweden’s most famous parks would look like without trees. Besides for print ads, the campaign went primarily in digital channels as videos on Facebook and pre-rolls on YouTube and Expressen.se. At the campaign site one could help Vi Agroforestry take up the fight against trivial hashtags on Twitter by a "Hashtag Battle". 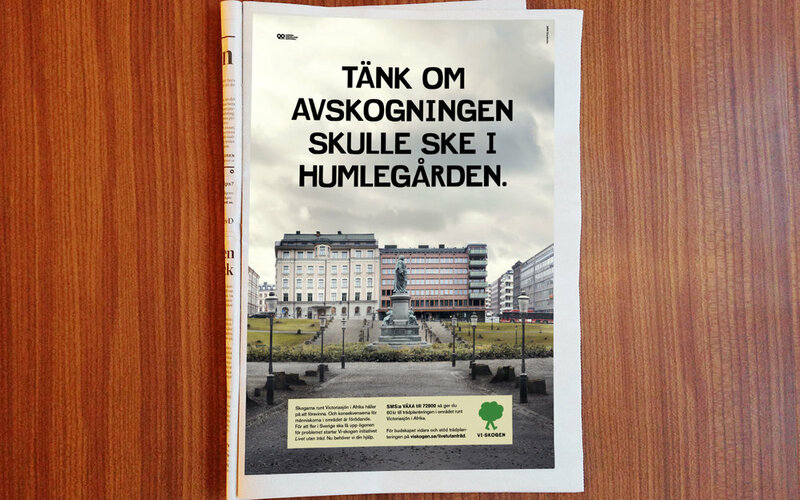 Vi-skogen also called for a grassroots campaign, where people were invited to print or order posters and put up on notice boards in Swedish parks, and then document it on Instagram. At the site one could also learn more about deforestation and contribute to tree planting in Africa.